The 7 Habits of Highly Effective People is the biggest self help book seller of the last thirty years. And while that doesn’t necessarily mean high quality… It does in this case. Covey says most people look for quick fixes. They see a big success and want to know how he did it, believing (and hoping) they can do the same following a quick bullet list. But real change, the author says, comes not from the outside in, but from the inside out. And the most fundamental way of changing yourself is through a paradigm shift. That paradigm shift is a new way of looking at the world. The 7 Habits of Highly Effective People presents an approach to effectiveness based on character and principles. The first three habits indeed deal with yourself because it all starts with you. The first three habits move you from dependence from the world to the independence of making your own world. Habits 4, 5 and 6 are about people and relationships. The will move you from independence to interdependence. Such, cooperating to achieve more than you could have by yourself. The last habit, habit number 7, focuses on continuous growth and improvement. Proactive is not what most people would think it is. For Covey being proactive means exercising your power of choice between the stimulus you receive from the world and your response. If you feel down it’s because you allowed the stimulus to bring you down. This is also a major stoic philosophy pillar which Ryan Holiday also renders in his fantastic The Obstacle is The Way. Covey introduces the “circle of control” to represent all that we care about. We can only influence a portion of what we care about, and that’s where we should be focusing on. Focusing on anything else means focusing on what the author calls “the circle of concerns”. Focusing on what we cannot control is a waste of time and energy. And often also spoils our mood because it takes the form of worrying and complaining. Ironically, the more you focus on the things you can control, the more your abilities and skills improve. Which in turn will further enlarge your circle of influence. Beginning with the end in mind means being clear about who you want to be and where you want to gp. And then travel that path. Habit two is based on imagination and on the idea that two different forms of creation exist: mental creation and physical creation. The mental creation comes first, and the physical creation follows the mental one. Covey says that if you are not clear about the mental creation of where you want to be you are the mercy of randomness and circumstances. Covey recommends that as much as you think about your life goals, you also think about who you want to be. When you have that clear, you can draft principles and values in accordance to that person (check Principles to see Ray Dalio’s). With your principles and values clear you will approach life and all the events in your life with a high level of clarity and confidence. To make sure your life goals and personal principles are aligned Covey recommends you write a personal missions statement. The mission statement should answer the questions “who do you want to be and what you do want to accomplish”. My Note: this chapter reminded me of the auto suggestion chapter in Think and Grow Rich. Habit three is all about prioritization. If you follow the steps of Habit 1 and 2 then you have your values and life goal very clear. This means you know what are your priorities.. And which are not. Basically, your first and major prioritization is through the filter of your life goals. Once you have a burning desire to become and do what you want your yeses will also clearly show what are your nos. That’s the bedrock of prioritization. Dovey introduces the now famous time quadrant. 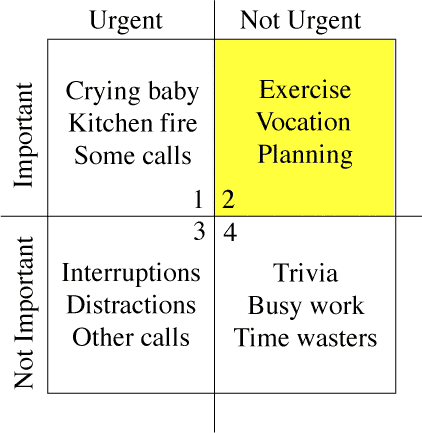 To effectively manage your time you should spend most of your time on non urgent and important tasks. This way you will rarely have to deal with urgent and important tasks, which heighten your stress and often deliver sub-bar results. Covey says that win/win is a character based approach to human interactions. I particularly liked that the author stresses the importance of integrity in the sense of aligning yourself with your public actions. Read here how to acquire framework self esteem based on your identity. The author says most people think in terms of either/or: it’s either you’re nice (and a push over) or you’re tough (and get you own way). This is what Brene Brown calls Viking or Victim mentality in Daring Greatly. Maturity instead is that happy balance in between. It requires you be empathic and confident, considerate and brave, all at the same time. Covey talks about human relationships in terms of emotional and human balance. He says when you approach life with a win / win mindset, you always treat people well and you make deposits in your emotional bank. If one day something goes wrong and you need a withdrawal, you can count on years of systematical balance surpluses. And people will be happy to help you. This theory reflects the view of social interactions as exchanges, with which I agree with (check my article for more). Covey says that communication is the most important skill in life. And we are all heavily under-trained in listening. Indeed, very few people even listen at all. Which is a pity, because the foundation of influencing people is to first understand them. Even most good listeners stop at the third level of attentive listening. Empathic listening removes your own frame of reference as much as possible. It looks at their body language, the tone of voice and nonverbal gestures. Ultimately empathic listening means putting yourself in their shoes feeling what they’re feeling. 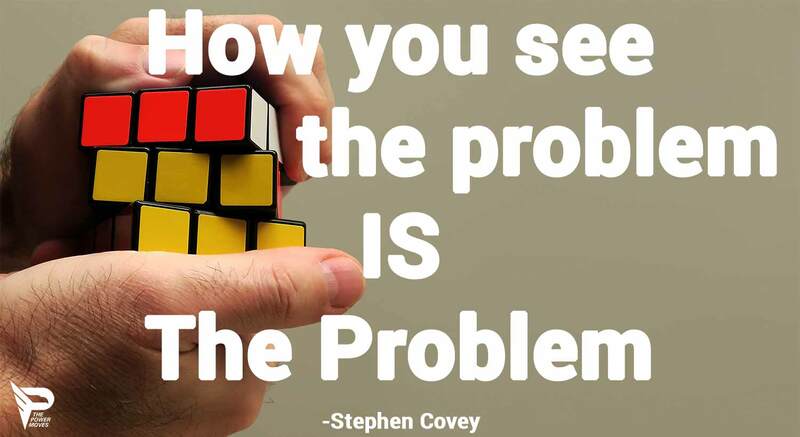 This is key because before people can move to solutions they need to feel you understand them. To be understood the author advises not to start and communicate with just logic but to explain where you’re coming from emotionally as well. I agree. Trying to completely take emotions away might seem “stronger” but ultimately destroys relationships (see the emotionally unavailable men article). Dale Carnegie proposes the same approach in How To Win Friends and Influence People. And if you want to read practical applications in conversations I recommend the books Crucial Conversations and Difficult Conversations. Or check all my summaries on communication. The idea of synergizing is that the whole of a well functioning team is greater than the mere sum of its part. The key to an effective group synergy, says the author, is to really value the differences among us. So ask yourself: do you want to be right, do you want everyone to agree? Learn to embrace differences as a strength instead. Synergy also entails “flow” and perfect group automation as if the group was functioning as one. That’s when you achieve top results. No habits in the world will take you far unless you preserve, take care and keep improving on yourself. He says it’s important you commit some time for each one dimension. And he’s right. Nobody can make you feel bad if you don’t allow them. Your mind is yours, you wield the ultimate power. Do and spend time on the things you care for and that will lead you to where you want to be. Don’t allow circumstances to sidetrack you. Do you really like what you’re doing? Is what you’re doing taking you where you want to be? The 7 Habits of Highly Successful People is a fantastic book. I would say it’s a must-read. The last thing I’d like you to notice is that Stephen Covey says even today, more than a decade after he wrote the book, still struggles with the principles. It’s a constant practice, he says. The better you get, the more you see you can do better.